Onsens are big communal baths with hot spring water, usually in hotels. I know communal baths may sound odd to Westerners, but once you experience that sense of freedom and the openness, just being your natural self in the open air, you will definitely come back for more of its luxury. Springs are known for containing many skin-beneficial ingredients such as sulphur, chloride ion, and hydrogen carbonate. Also, warming the body helps improve blood flow which leads to relief for stiff shoulders, back pain, muscle pain, etc. Depending on the region, the quality of the spring changes, and onsen fans love travelling across the country in search for their favourite. My favourite destination for Onsen is Ito, one of the most famous and popular onsen towns in Japan, just ninety minute train ride from busy Tokyo. For my last trip to Ito, I chose DHC’s Akazawa Onsen Hotel as my host. With more than 10 types of onsens, including a rooftop open-air onsen with a panoramic view of the ocean, jet baths, and a little private onsen in my room, I could have spent the whole day trying out different onsens, but there was so much more to do there it kept me so busy. First of all, the food was amazing. DHC owns the Akazawa Fishing Harbor which is located right by the hotel, allowing fresh seafood to be served at the hotel’s restaurant. With the view of the great Pacific Ocean, true Japanese food is served with beautiful colours and fine artistic decorations. Akazawa Onsen Hotel is actually just a small part of the whole facility. They also have a spa area where I enjoyed a massage, sauna, training gym, tennis, and even bowling! Especially recommended is the Akazawa Deep Sea Spa, which is an indoor whirlpool filled with seawater drawn from 800 meters deep. The lukewarm, mineral-rich water creates negative ion vapour, filling the whole pool house. Just by walking around in the whirlpool helps you get exercise, massage, and relaxing effects. I also got to DRINK this mineral-rich deep sea water, bottled and free at the pool side! 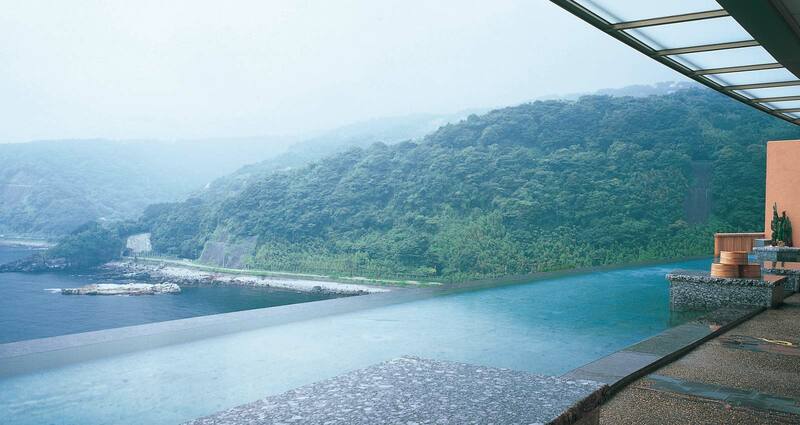 Perfect for those who find communal baths challenging, but still want the benefits of Onsen. The most exciting moment came when I realised that all the amenities throughout the facility were DHC brand. This means that we get to try out the products as much as we need before deciding which ones to get for ourselves. I also found it so convenient that they have official stores located within the facility so we can just grab what we liked and have it right away. This covers the souvenir shopping too! While taking my last minute look-around, I came across a building in profound silence. Anybody could sense the high-class-feel it holds. Later I found out that it was Akazawa Geihinkan, a luxurious hideaway for discerning Onsen experts. The sophisticated Japanese rooms are all supplied with the highest quality of DHC skincare products which you can take home with you after your stay. All rooms have private gardens with a small open-air Onsen all for yourself. Meals are served in private rooms, with a wide variety of sake to accompany your fresh seafood. This is definitely next in line for my next trip to Ito—to enjoy the omotenashi, Japan quality hospitality I have yet to experience.